Back cover blurb: After warnings from a doctor, and with his wife Myra's encouragement, Sir Harry Secombe has lost almost four stone in six months. Here - in what is more than just a diet book - he shares the secrets of his success, giving all the information you need to lose weight and improve your health. 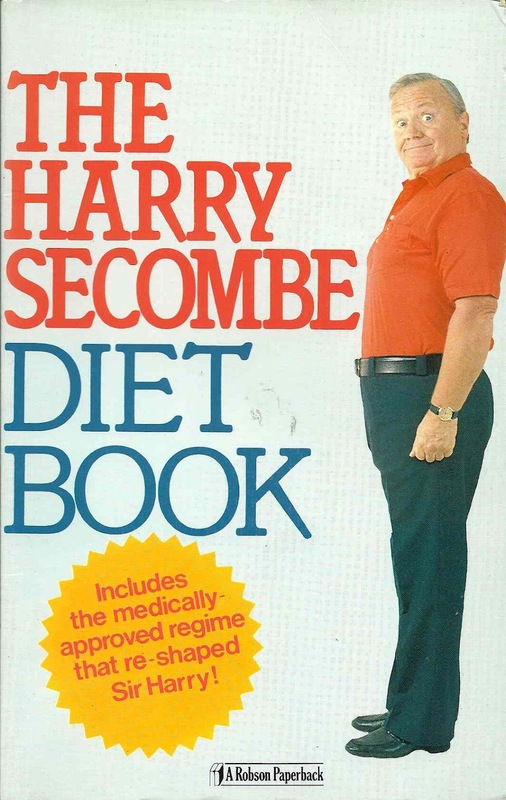 And Sir Harry hasn't lost his sense of humour - this is probably the first seriously diet book that makes you laugh as well! Quick flick reveals: These days celebrity diet and exercise plans are the domain of glamourous soap stars who temporarily let themselves go a bit as a career move. In the 80s, however, there was more than enough room in that arena for Sir Harry Secombe. This book made me think. Specifically, it made me think, 'yes, Harry Secombe was a lot fatter in the 70s than the 80s, I have never noticed that before'. Here he explains exactly how he did it, in a friendly, approachable way filled with facts useful for anybody who wants to make that leap from 'morbidly obese' to merely 'clinically overweight'. Actually looks a lot more sensible (and realistic) than a lot of the faddy nonsense that circulates today, blinding people with dubious science. Random paragraph: 'When I hit it big in my career at last, I also hit it big on my belly. There was a whole new world out there - and it all had food in it. If I was working abroad, I had to fly and that meant whiling away the airborne hours with all the drinks and juices and snacks and meals they cared to wheel in my direction. I had to have a special extension put on my seatbelt, though there was little risk of my being hurled out of my seat in a touch of turbulence. On the contrary, when we landed, I had to wait till the other passengers had got off before someone had time to come and lever me out.